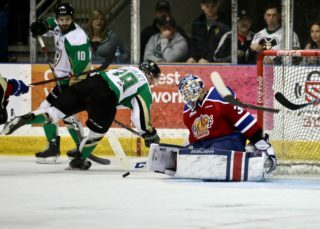 Prince Albert, SK – The Prince Albert Raiders (13-1-0-0) scored another victory on Tuesday night, shutting out the Everett Silvertips (7-5-0-0) by a score of 3-0 at the Art Hauser Centre. Ian Scott made 24 saves for his second shutout of the season and 11th win. Brett Leason extended his point streak to 14 games with a pair of goals. 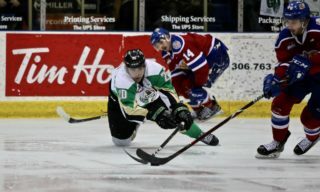 The win also snapped a six-game losing streak against the Silvertips. 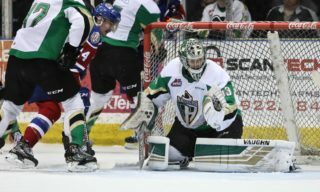 A tight-checking first period saw the Raiders put 10 shots on Silvertips goaltender Dustin Wolf, who turned aside all attempts. The best chance came late in the period when Cole Fonstad led Spencer Moe with a breakaway pass. The winger from Calgary deked to his backhand, but Wolf made the glove save. In the second, the Raiders penalty killers went to work. 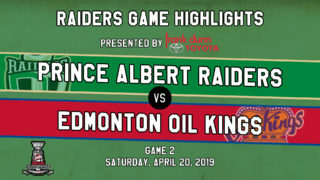 The Raiders took three penalties in the first five minutes of the period, but they were able to keep the Silvertips off the scoreboard. Leason opened the scoring at the 6:43 mark of the second period. Aliaksei Protas made a perfect cross-rink pass to Leason, who put his shot top shelf for his 12th goal of the year. That goal held up as the only marker until the final three minutes of the game. Leason stripped Everett defenceman Sahvan Khaira, deked around another Silvertip, and picked the corner over Wolf’s glove to make it a 2-0 game with 2:40 to play. Justin Nachbaur rounded out the scoring with an empty-net goal with 17 seconds left. In a losing effort, Wolf made 27 saves for the Silvertips. 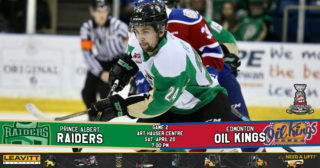 The Raiders hit the road on Wednesday night to take on the Moose Jaw Warriors (5-3-2-0) at Mosaic Place. Puck drop is 7 p.m. Catch the game at The Rock And Iron Sports Bar located at the Prince Albert Golf and Curling Club. The next Raiders’ home game is on Saturday night when the Regina Pats (3-9-0-0) come to town. Tickets are available at the Raider Office and at raiderhockey.com. Game time is 7 p.m.